While setting up a few new users I was getting an error while trying to add a new email account. 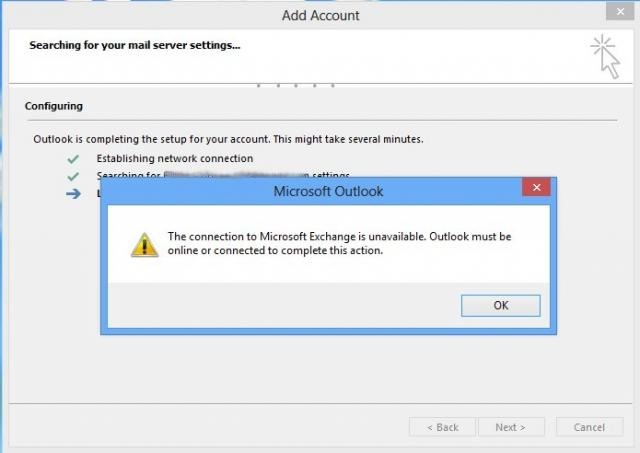 While walking through the default setup – simply launching Outlook on a new users profile (who, of course, has and email account associated with his AD account) Outlook gave an error message that said, "The connection to Microsoft Exchange is unavailable. Outlook must be online or connected to complete this action." Now, I know that I’m online on the domain – the new user authenticated. AND I could ping the Exchange server via name too. Also since there are other users on this device and it’s fairly new I was pretty sure that it’s not a system error. 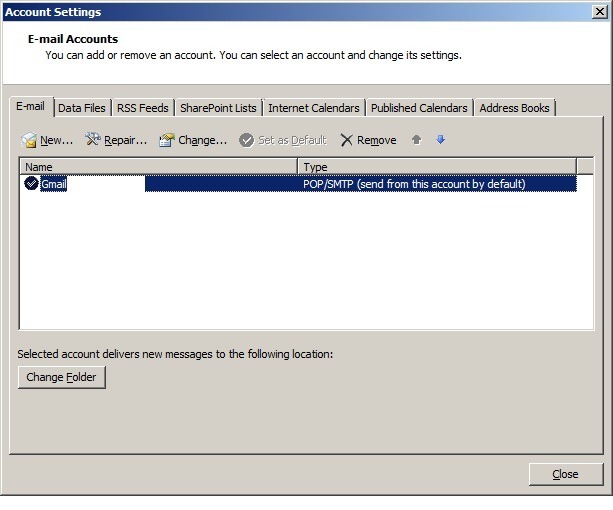 Per MS – This behavior occurs when the Exchange Server computer (where the Outlook client is homed) and the global catalog server are both located in a site that is remote from the Outlook client location. (article here). In the Open box, type regedit.exe, and then click OK. Note You may have to create the registry path. Restart the PC and you should be able to reopen Microsoft Outlook and run through your profile set up. If finding the global catalog server was the issue, the problem should now be resolved and the email account should now properly add properly. So after setting up new PC I’ve been going through some things that might help some others. So to move my Outlook file and settings I did the ‘usual’. to a ‘temporary’ folder on the new PC. I will then copy that folder to the new proper location after I import the Profile settings, as described below. First I exported the old settings and them copied them over to the new machine and imported them. 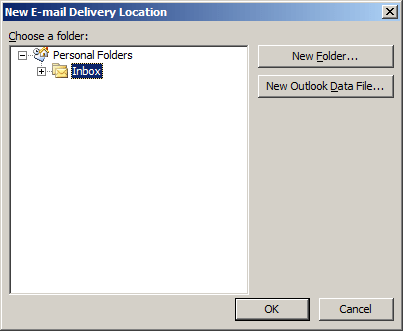 In Microsoft Outlook you can easily export some types of information to a file. However, there is no option to export your profile e.g. when you want to have the same settings on another computer and you do not want to manually put all of them together with the account details again. In order to do so, you can use the Windows Registry Editor that gives access to all the information. Expand the following registry entry: HKEY_CURRENT_USER\Software\Microsoft\Windows NT\CurrentVersion\Windows Messaging Subsystem\Profiles. You will see a list of your profiles. 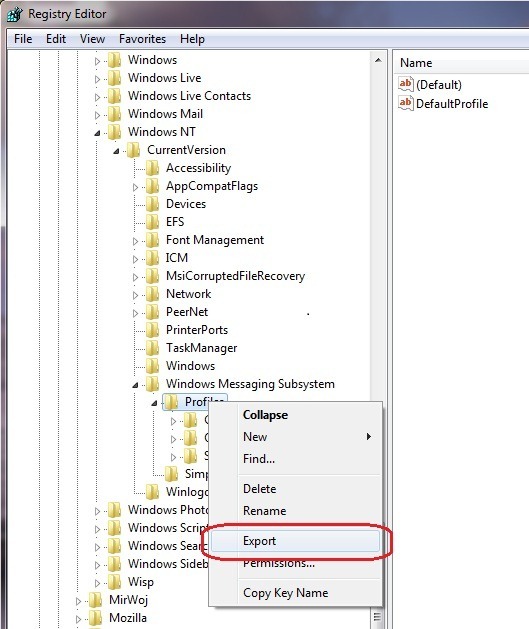 Then, you can specify the name of the registry file and the location to save it e.g. Desktop. Confirm that you want to make changes to the registry. Now launch Outlook on the new machine and you will most likely get an error saying the .pst file was not found. NO big deal yet. OK/Close your way through the next few windows to EXIT the application. Here we’re only trying to create the default folder/location. Now run your Outlook, the new profile will be opened (if you have only one) or you will be prompted to choose one of profiles (if you have more than one). And it ‘should’ work. At the minimum you should see all of your old mail, folders, contacts and calendars. Arghh. So here is the fix that worked for me. Seems that the ‘Folder Location’ for the deliver of email was not properly ‘pathed’. Here is how to fix that. 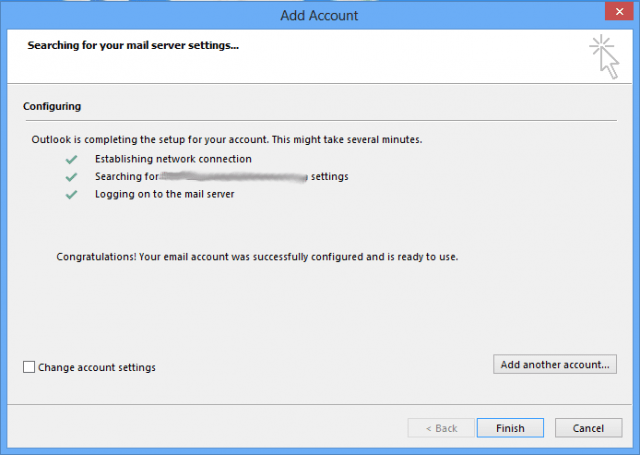 Changing the folder to specify inbox fixed the issue. Apparently the inbox did not get set and the higher level file name was selected. 3. Click the + to the left of the folder name to expand the subfolders. Click on ‘New Folder’ and create a new ‘temp’ folder; call it 01 or what ever, and select it. Click OK then you should now see a Folder location in the ‘Change Folder button on the lower left. 4. Now let’s go back Click on Change Folder and now Select the ‘Inbox’ instead of that ‘01’ folder and click OK. The change should now ‘stick’ for you. Click Inbox. 5. 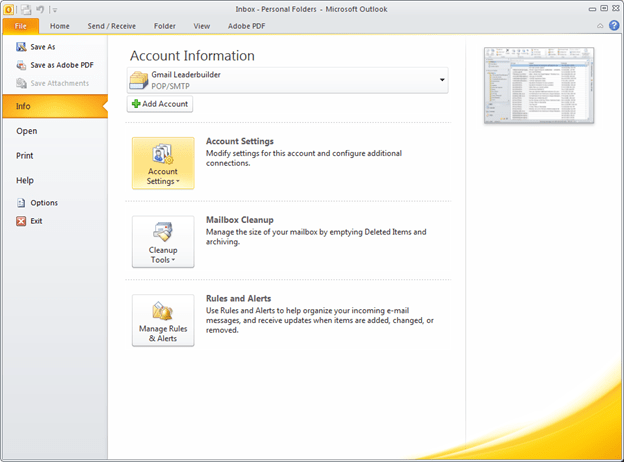 Close Account Settings and click send/receive. And you should be good to go. It’s an obvious bug that the settings won’t ‘stick’. But this works! Hope that helps some. I’m sure I’ll be referring back to it. How I recently fixed one hell of an Outlook 2007 to Exchange 2003 connection problem. This occurred on brand new Windows 7 Enterprise AND brand new Windows XP workstations while trying to configure the Outlook clients to connect to our Exchange 2003 server. 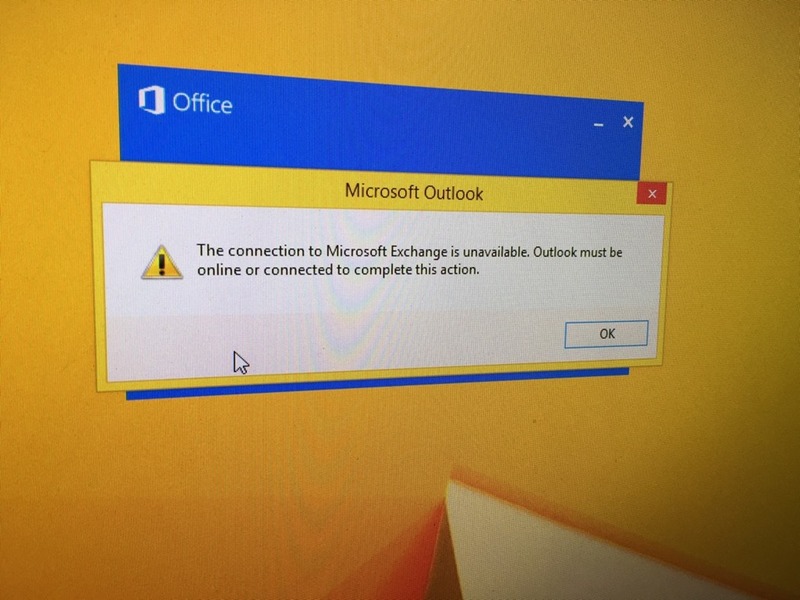 "The connection to Microsoft Exchange is unavailable. 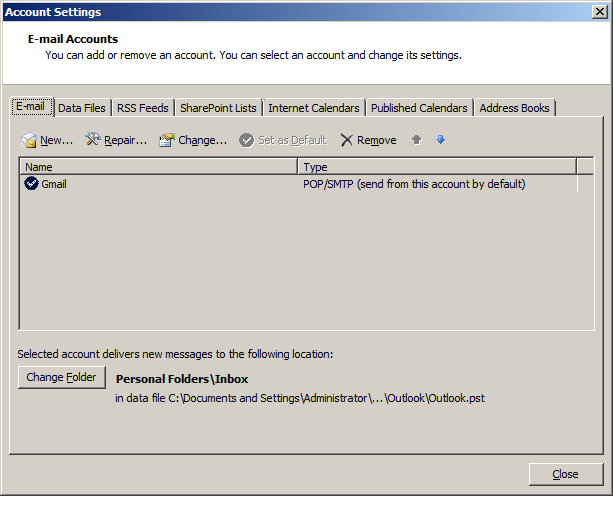 Outlook must be online or connected to complete – Cant add Outlook accounts.."
Worse still is that this problem did not occur one every new workstation! Windows XP or Windows 7 – only some random ones. I checked all network/connectivity parameters I could – DNS, LDAP, RPC, TCP/IP etc., and otherwise checked routing and name resolution ad nauseum. And all checked out. I had this problem a year or so ago but could not find any of my notes! Aggravating to no end. So I swore I would make sure to document my fix when I found one. So Google here I come…. I checked that the ‘Attendant’ service was running on Exchange; it has been for a few years. And virtually everything mentioned in every article I could find – 5 days of searching and hundreds of pages!! I also tried importing the Outlook registry keys from machines (both Windows 7 and Windows XP) that do work – still no joy. I literally went 11 pages deep on Google http://goo.gl/EddW9 and many, many more deep from each of those, looking for a fix! I read deep somewhere in one post that someone mentioned running ‘Outlook rpcdiag’ – I don’t remember that switch. I checked RPC on the machine(s) and it showed no errors already right.. But since this was a specific ‘Outlook’ switch I though what the hell. "outlook /rpcdiag" from the command line. It tried to ‘find connections error’ but did not report anything. Damn..
Then it just closed after it could not really start. Then I started Outlook in Safemode (I was prompted to upon launching Outlook, but it can be run "outlook /safe"). I was then able to add and configure the Exchange account and get connected!! I waited until it updated the mailbox completely. Then I restarted Outlook normally and IT WORKS NOW on all of the affected boxes! I am not sure if all of these steps need to be taken but I now have a plan to follow. I hope this may help someone, because from most of the posts I read it is a MAJOR issue and MS is not doing much about it! At least I’ll have my notes.